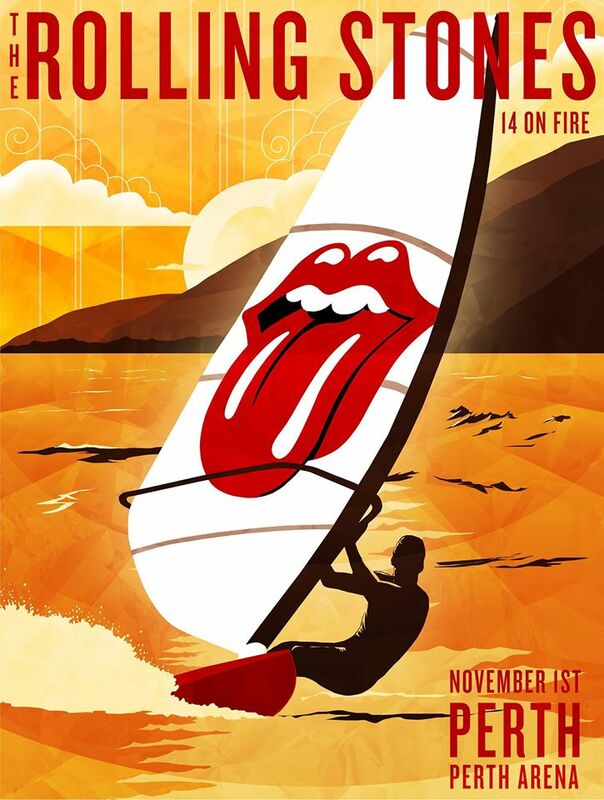 This thread is for live updates and comments regarding The Rolling Stones show #2 in Perth Australia 1 November 2014. Please tell us your pre- and post-show thoughts and comments here. Edited 2 time(s). Last edit at 2014-11-01 06:40 by bv. Thanks all, and enjoy tonite.i know I will!!! 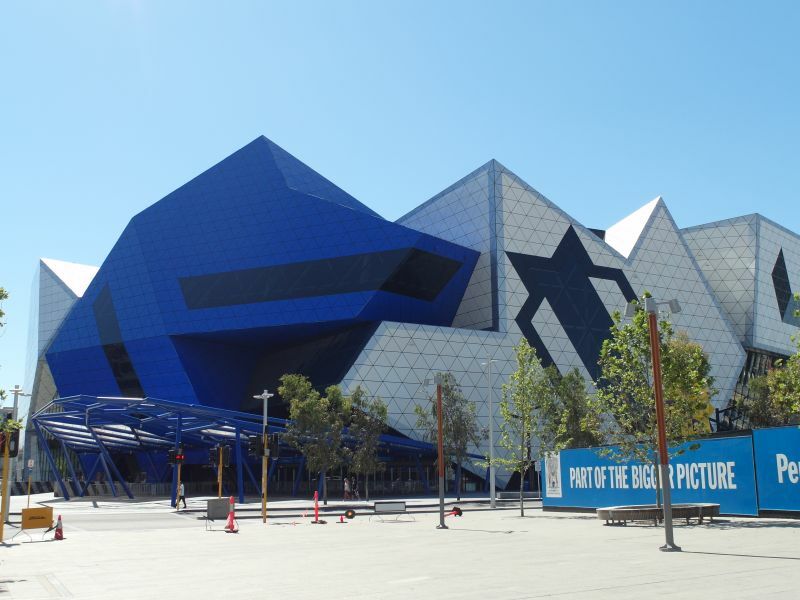 Some informations about the Perth Arena can be found in Wikipedia. Beautiful day here in Perth. Flew over on the red eye from Melbourne last night so am pretty tired. Checked out the awesome Dada Records and picked up a Muddy Waters Folk Singer and Gram Parsons sleepless nights CDs for cheap. A good start to the day. Now wish me luck on my lucky dip tickets! The temperature was +27 C daytime earlier this week, but dropped down to +21 C and some wind during the past two ways. 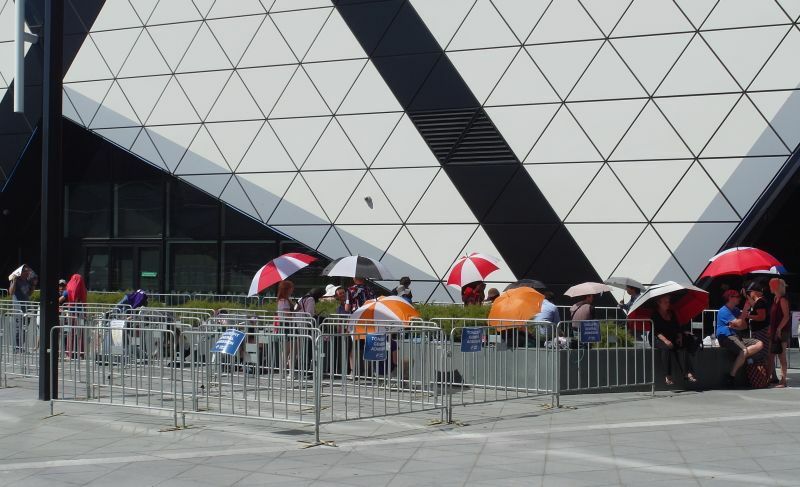 Today it is just a light breeze, hot +27 C in the shade, and they really need an umbrella for the sun in the pit queue today. The first ones have been queuing since this morning. They say it is 70 people total on the VIP package list, the rest is regular pit tickets. The pit takes approx 400 people. 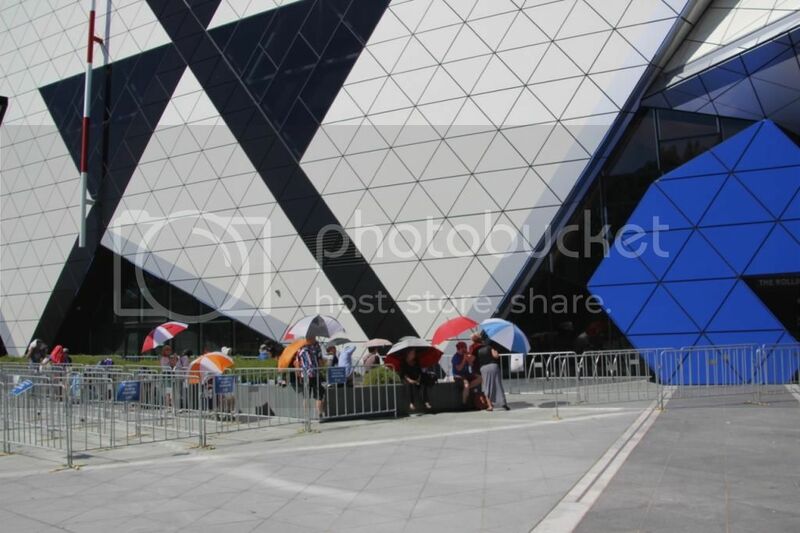 At 3pm there were around 30-40 people queuing for the pit, most people queuing in the regular pit queue, which is in front of the package VIP queue, as seen in the picture below. And here you folks go again, hah-hah! Fond memories of my only visit to Perth during The Ashes hammering 2006/7...ouch! Here's to another great show! ps is the 'Lucky Shag' waterfront bar still going I wonder? That venue looks amazing. Somewhat surprised so few people are in the queue, though, given the amount of time I spent this summer in overnight lines for other bands. 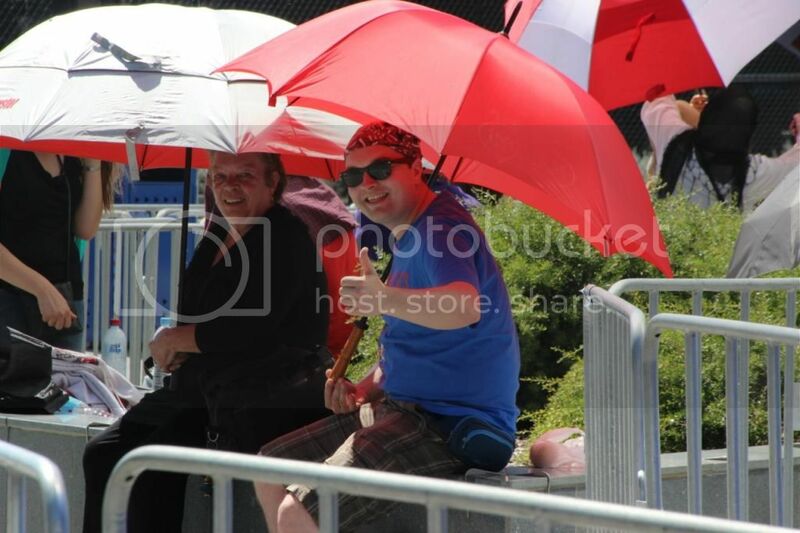 But if it means that the diehards get a good spot, that's great! Enjoy the show, the sun and the +27C. Light snowing by -7C here in the north of sweden. Moral of story ....... put in the time, and reap the reward !! Ain't no other way folks !! Have a great gig everyone. I'm there in spirit! To those going to the concert. Have a great and safe time!!! Have a great time everyone,and I will be watching it all happening on IORR, over here in Spain. Lucky Dip got me block 323 side view. If they have speakers pointing around that's better than way up the back. Person next to me got the same. I guessing most will be there! LOL! Enjoy the snow & the show, blackbird! what are the prices like? Best items? Edited 2 time(s). Last edit at 2016-02-07 19:48 by colonial. Wishing all a great concert! Still to little snow for having fun with the snowmobil. So it will be enjoying the show here on iorr for me instead. Edited 2 time(s). Last edit at 2016-02-07 19:47 by colonial. 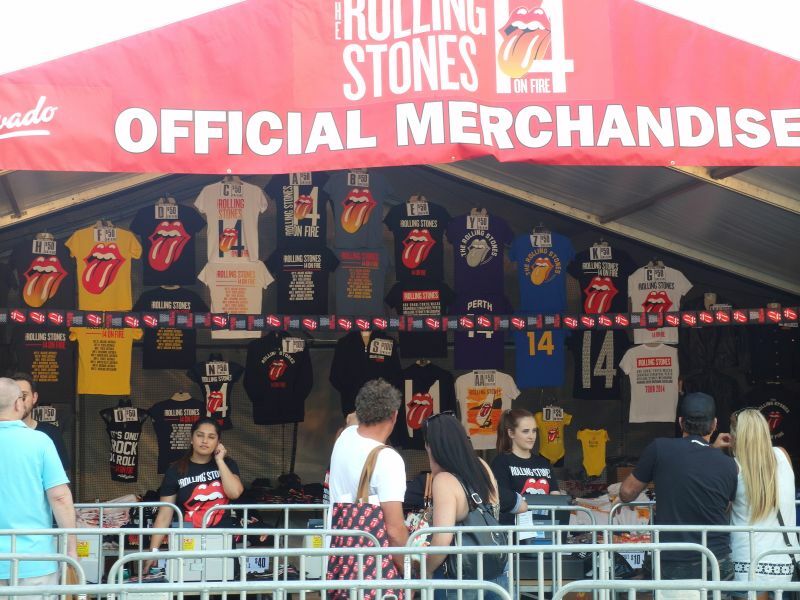 I hope the best ever Australien Stones gig is in this city in a short while! Sunny and foggy day here in Valenza - Italy! For the 3rd time .....LET'S SPEND LUNCH TIME TOGETHER ! Edited 2 time(s). Last edit at 2014-11-01 14:13 by Irix.